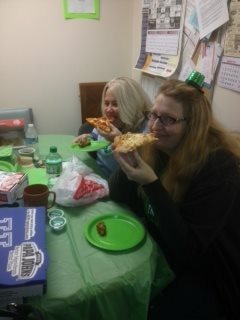 Cynthiana Vision Wins St. Patrick’s Day Lunch! Cythinana Vision and Q-2100 Technician Angel Miller were selected as the winners of the St. Patrick’s Day Lunch event sponsored by Optical Dynamics. A self-professed “comic book geek”, animal lover, and artist, Angel donned a tiny St. Paddy’s day hat for the festivities.